When Magellanes landed 1521 on the island of Homahon, he took possession on behalf of King Philipp II and named it Felipinas – the Philippine`s. Prior to this Spanish colonization in 1521, the Filipinos had a rich culture and were trading with the Chinese and the Japanese. The Spaniards recognized the potential of these strategically well positioned islands and they established 1571 in Manila a colonial government, from where they controlled the country and the trade. Spain’s colonization brought the construction of Intamuros in 1571, a „Walled City“ comprised of European buildings and churches, replicated in different parts of the archipelago. In 1898, after 350 years and 300 rebellions, the Filipinos, with leaders like Jose Rizal and Emilio Aguinaldo, succeeded in winning their independence. 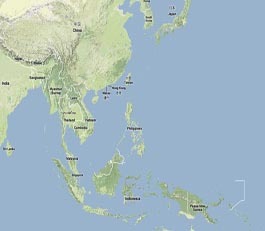 The Philippine`s can be found in South-East-Asia, to the north of the equator and 160 kilometers to the south of Taiwan. The Philippine`s is made up of 7,107 islands covering a land area of 299,404 square kilometers. Approximately 2.000 islands are inhabited. More than 2.500 islands are not registered. Some 80% of the population is Catholic, Spain’s lasting legacy. About 15% is Moslem and these people can be found basically in Mindanao. The rest of the population is made up mostly of smaller Christian denominations and Buddhist. The Philippines is the world’s third-largest English-speaking country next to the United States and the United Kingdom. Therefore, English is widely spoken in the Philippines, and most signs are in English. The national language is Pilipino (Tagalog) but there are over 100 regional dialects. 220 volts a/c (60 Hertz) is the common standard. The Philippine’s monetary unit is the peso, divided into 100 centavos. Foreign currency may be exchanged at any hotels, most large department stores, banks, and authorized money changing shops accredited by the Central Bank of the Philippines. International credit cards such as Visa, Diners Club, Master Card, and American Express are accepted in major establishments. Citizens from most countries may enter the Philippines without a visa upon presentation of their passport, which must be valid for at least six months after entry, and a return ticket to the home country or an onward ticket to another country. Upon arrival, immigration authorities will annotate the passport with an entry visa valid for 21 days. If you plan to stay longer than 21 days, you must apply for an extension at the Philippine Bureau of Immigration and Deportation. Persons who overstay their visas are subject to fines and detention by Philippine immigration authorities.